I really enjoyed the quick knit of my last washcloth. After knitting up a couple of them, I was ready for another hand knit washcloth pattern. I like the Chinese Wave Pattern for the loft it creates. It has a thickness to it that you just don't get with a garter stitch. In addition to the texture, it is a very pretty pattern. I see diamonds in the pattern more than waves, but that's just me. My daughter wants to use these in her bathroom, so I added a crochet picot edge, which really upped the charm of the washcloth. I can also see knitting up a bunch of these and using them as gifts, with some soap or bubble bath. They really have a ‘spa' look and feel to them. This Chinese Wave Knit Washcloth Pattern is really relatively easy, but you do need to pay attention to what row you need to start. 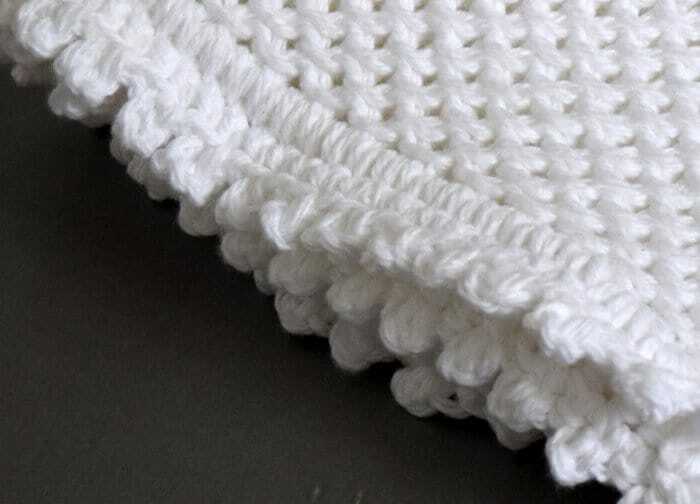 The slipped stitch makes the stitch twist, so if you have to rip out a row, it makes it more difficult to get the twist right and you'll notice a slight difference in that row. After detailing the Chinese Wave Knit Washcloth Pattern, I explain how I stayed on track. Sl1 Slip next stitch from left-hand needle to right without working. I slip knitwise. 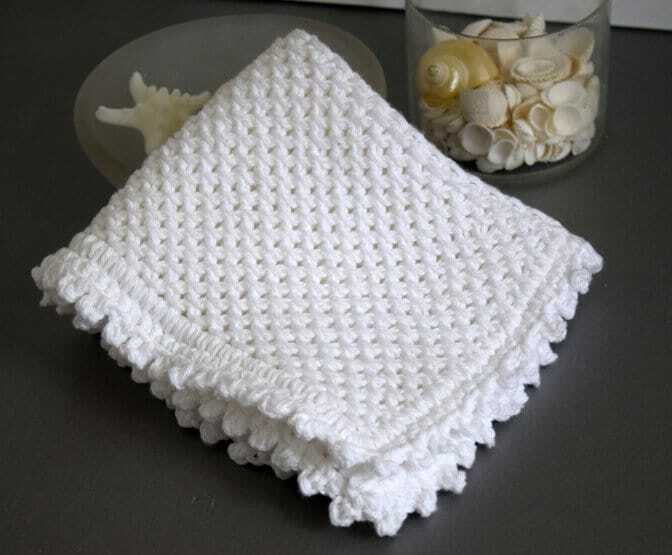 If you want to resize your washcloth, I have explained that process on this post: How to Resize a Blanket, Washcloth or Towel. Repeat rows 2-5 for the remainder of the pattern until your work measures 11.25 inches, ending with a Knit row. Bind off, but don't cut yarn. Using crochet hook, SC into each Stitch. It's pretty easy to see where to pick up on your cast on and cast off row, but a little harder on the sides. This picture shows, that on the back side of your piece, you can see the ‘valleys' in the pattern on the sides of washcloth. Put your crochet hook in these valleys on the sides. I try to catch the yarn tails from my cast on so that they're wrapped in the SCs. Makes it nice not to have loose tails. When you come to one of your corners, you'll want to SC in the last stitch before you turn. Then work 2 chains on top of that stitch and then SC back in the same stitch. When you get back to where you started, you'll start your picot. You will now have 3 stitches on your hook. Grab the yarn and pull it through the 3 stitches, leaving only one stitch on your hook. There's your first picot. Repeat this pattern until the end of your work and work your tail into the pattern. These knit up quickly and are perfect for your home or for gifting. If you choose to gift some of these like I'll be doing, add these washcloths to a couple of other items for a perfect gift. Pairing your washcloth with any of these ‘pink' products would make such a fun and girly gift. Stick to cotton or cotton blends for your dishcloths. If you go the blend route, make sure it is primarily cotton (70/30 or 80/20) as the cotton is what makes the yarn absorbent. Happy Knitting my friends! If you have a favorite hand knit washcloth pattern, I'd love to see it. Pin this Chinese Wave Knit Washcloth Pattern for your future reference. Looking for more knit and crochet patterns? Really lovely design, I need to try it out soon, it’ll make a nice gift. Thanks for the kind words Daniel. I’m going to be making quite a few for my daughter and her roommate as they head to college this fall. Thanks for the beautiful pattern! I’m new to your website. Do you have a print-friendly option? Hi Hilary! So glad you found my blog and my patterns. Access to a printable version of my patterns is available to all my subscribers; a password is sent upon subscribing. Let me know if you have a problem accessing it and I will gladly help. : Beautiful it looks like you are slipping knit wise. I make this pattern a lot but I slip purl wise. This will give you the waves. But I love yours, especially the crochet edge. I will try that. Thank you for sharing. Thanks so much Joan! I enjoy knitting them! Lovely design. Thank you for sharing. Would be making it soon. Thanks! Hope you enjoy the pattern. If you’re on the east coast like I am, this will be a good weekend to stay inside and knit! Yes, I am on east coast. Planned to travel to Vermont to see foliage.. Had to cancel and stay indoors ! Thanks again for your pattern and photos . very pretty! On the slipped stitches, are they slipped knitwise or purlwise and with yarn in front or back? Hi Susan, I know I slip knitwise so I’m pretty sure the yarn is in the back. I think if you slop purlwise it’s a little looser. Enjoy! This is a gorgeous wash cloth! And I love how talented and multi-faceted you are!!! I knit, but I don’t crochet, I may have to attempt this with your direction! Pinning! Thanks for the details, it really is a lovely pattern! That washcloth was one of the first things I put a crochet edge on. Just taught myself last year…there is certainly a difference, but I feel if you can do one you can do the other. Give it a try! Hi Shae, I just discovered this comment from last month. I am very hopeful that you were successful with the crochet edging. Do stop back by and let me know how it turned out! Hi Shae, yes you do a picot chain in 1, then a sc in 1, then picot in 1, then sc in 1 and so one. Does this help? If not, write back and I’ll b glad to help. Thank you Lynn , after finishing 1 picot do I chain 1 before sc in next stitch or just sc? Any suggestions for corners? Thank you so much! Hi Lynn, I’m practicing on swatch before I actually implement on my piece. I’m having trouble with corners , how did you stitch corners when adding the sc edge, and with the picot? I’m really having fun with this! Thank you so much for the guidance ! Hi Shae, O.K. here’s the rub. I have given all my picot edged washcloths to my daughter so I don’t have one at home to see exactly what I did on the corners. I’ve been having her send me photos of the corners, but I’m still having a hard time seeing exactly what’s going on. But…I ‘think’ , underscore ‘think’ that I just worked whatever came next when I came to a corner. However, I would find a way to work an extra sc or 2 in as well on that corner. If it’s a picot then I’d add another sc into the same stitch you worked the picot. Think I probably tried to get a picot at each corner since that looks nicer. Even and square on foundation sc corners. Got it…good luck with the corners and let me know if I can help any more. you are so welcome. let me know how it goes. Hi Lynn, I have finished this and ready to put the border on yay! Just measured it it came out 11x 9 not sure why this happened? Also when it says ac in each stitch is that each stitch or each chain ! Thank you, it’s so pretty! Good Morning Shae…yay! Could you add another 2″ to make it a square? Completely up to you. Are you asking about starting your edging? If so, you are doing a sc into each space between the knit stitches. Look at the third photo in the post, see that hole made between the two knit stitches? That’s where you’ll put your crochet hook in to attach the yarn for the edge. Does that make sense? If not, let me know. Hi Shae…I can’t quite picture what you’re saying…how’s it working? I put the sc in the chain of the cast off row as you would if putting them in chain row in Crocet under the 2 feet of the chain , does that make sense? I think that makes sense and I think that’s probably right. The image in my post is for the side, which is more challenging, i think, than the cast of row. sounds like you’re on the right path. Hi Lynn, turned out great. Also completed the cable lattice as well. I’m not sure why mine come out ruffly looking? Also I never get 11×11. My mom and sister loved them they were gifts for them. Hi Kim, to slip knit wise means to insert your needle in the next stitch as if you were going to knit it, but don’t knit it, just slip it on to your right hand needle. To slip purl wise means to insert your needle into the next stitch as if you were going to purl it, but slip it off onto your left hand needle. Hi Kim, I slip knitwise, which I think results in a tighter cloth. But yes, it is just a matter of personal preference. Have fun! Hi Lynn. I am practicing this pattern before I start with my cotton. I’m a good knitter, not great and I usually keep the pattern in my head and count things like you do. For the life of me I cannot tell which is the slip stitch once I have knitted a row over it. I’m trying to keep from keep track of rows like you do. Can you give me an idea of how to tell which is slipped? Asking a lot I know. Thanks. Camille…the best thing I can recommend is to use a row counter and whether the slip row is an odd or even row. I can tell you that I ripped out many rows before I became disciplined enough to do that. I don’t typically use row counters, but they are vital for this pattern. Your wash cloth is beautiful. I can’t seem to get mine to look like that. I’m adding the edging but it looks more like a ruffle. I am using a size I hook. I would appreciate any suggestions. Hi Shelly, I’m guessing that you didn’t pick up enough stitches when you started your crochet round. Sometimes it’s hard to see them all. Since you’ve done the hard stuff (that Chinese Wave is the hardest part! ), I’d take off the crochet edge and start again. Here’s a link to a youtube video that may be helpful. It’s a bit harder to see with the Chinese Wave, but just make sure that on the sides you pick up as many rows as you have and on the top and bottom what your cast on was, give or take just a few. Come back and let me know if you got it. Hi thank you for the pattern…..I followed the pattern but mine didn’t come beautiful like yours ? I don’t know what I did wrong. Hmmm…I’d be glad to try to troubleshoot it for you. Can you send an image of the washcloth to my email…[email protected] ? I have crocheted for years but have never been able to knit. My best achievement was a wonky edged scarf lol but decided to have a go at this and to my amazement it turned out great! I’m now doing some for my daughter but in a range of colours in the pink and lilac colour range. I’m so pleased. Thanks so much for introducing me to another craft! Oh Alison, you made my day!! And if you mastered that chinese wave stitch, I’d say you are doing pretty good. I think it’s one of the ones that require the most attention. Do pop in and check out the baby blanket pattern I just published today! I just adore it and it’s another that will require both knit and crochet…and there are videos! Have a fantastic weekend and thanks for popping in. I’m an experienced knitter and triple checked your pattern. I didn’t get diamonds, which is what I wanted. I got loopy scallops which just looks like sloppy knitting to me. Let me know if these suggestions make a difference for your washcloth. I’ve admired the Chinese wave pattern from a safe distance for ages, but how you’ve written the pattern is inspiring me! Before I get carried away with my naivete, please could I ask…there isn’t a pass slip stitch over, is there? It is just a slip 1, knit 1, slip 1 and so on…? Oh, I’m so glad you are going to dive into the Chinese Wave! It is such a lovely pattern. There is not a PSSO in the pattern, just slipping and knitting! Come back and let me know how it works for you! Absolutely gorgeous! Can’t wait to make a few as stocking stuffers 🙂 Thank you for sharing your beautiful pattern. They will make lovely stocking stuffers, especially when paired with a heavenly-scented bar of soap!